First, important life update, I got some gloves. I think they were meant for boys, but my hands are so small they work great for me. Now not only am I equipped to survive the chilly weather, I'll also be able to make a zillion snowballs on Friday, if we actually do finally get some snow (eeeeeeee)!! In the meantime, here's a toasty little winter dish that hits all the right spots. It's kinda fancy, supremely easy, and extra super delicious. I made it one night when I couldn't be bothered going to the grocery store, so had to use things we had lying around the house, plus some sage from the back garden. My roommate and I ate it with farro and it was incredible. I've since made it so many times I've used up all my home grown sage and have been begrudgingly buying sage at the grocery store. We usually eat this with some sort of grain (dressed with a little olive oil and lemon) but it works great on it's own as a snack. I bet it would also work well on the side of some chicken or atop a large bowl of pasta? There's a slightly high pesto to squash ratio in this recipe because I really like this pesto (and usually end up eating half of it on crackers while I wait for the squash to cook). Preheat the oven to 420F. Cut the squash into segments and remove seeds. 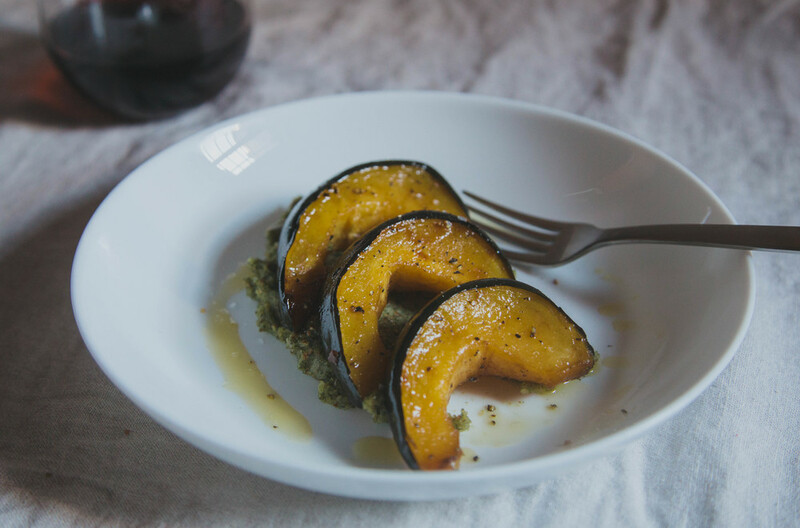 In a baking dish, mix the squash with olive oil, maple syrup, balsamic vinegar and season with salt & pepper. Roast squash in the oven for 30 - 40 minutes or until tender, turning half way through. In a small pan on a medium heat, gently toast the almonds. 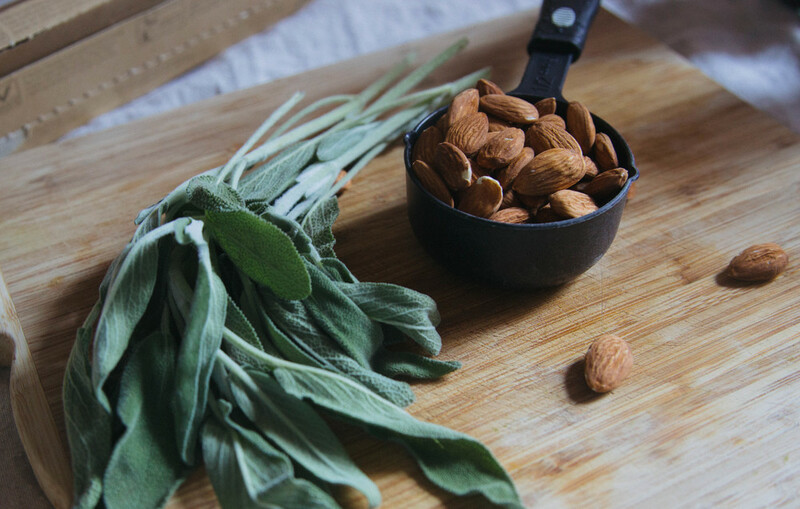 In a food processor, blend the sage, toasted almonds, pecorino, and lemon juice. Pour in the olive oil as you blend. Season with salt & pepper to taste.